I had to leave the house and drive the Jeep. It doesn't happen all that often that I get in the car and go for a ride. In fact, the Jeep is more often driven because I have to than I need to. If you leave a car too long things get bound up and weird things happen to it. Emergency brakes get stiff, brake drums may warp, rubber gets dried out, tires will flat spot. But this was a mission. I needed to mail a laptop to a friend in Atlanta. It should be there today. Just before lunch is a good time to stop off at that little post office in Oakland Park. It's right by the railroad tracks, just off of Dixie Highway. I don't have to go to the behemoth over on Oakland Park Boulevard. That place I can just about guarantee I will be standing in line behind some screaming kid wanting to be anywhere else than standing in that line. I feel your pain, kid, now shaddap! Stepping out into the sun, receipt in hand, Florida was being Florida. All around there were people working on the landscaping. Carving Coco Plums into regular shapes, cutting dropped fronds off the trees, and making this linear park look rather tidy. 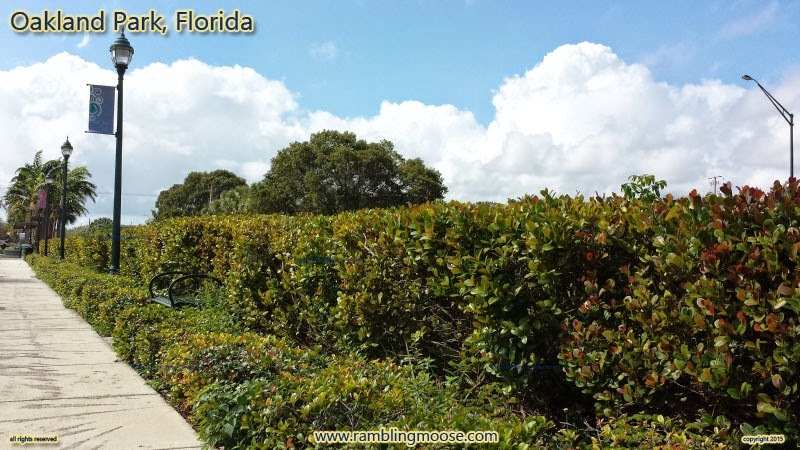 To look at the view, you wouldn't know that right on the other side of that hedge was the FEC Train Track that goes south to Fort Lauderdale and Miami, north to Jacksonville and beyond. I'm used to that sort of trail. My favorite park runs along the Schuylkill River in Philadelphia and stretches out to Valley Forge and Oaks PA. I've skated that entire distance, so wherever there is a linear park, I look to see if it's "Black Ice". Very hard to find an appropriate place to burn off a thousand or two calories like that. But get low enough and the tracks disappear. You'll see what I saw. It's actually a rather pretty spot. If the train goes by you may as well sit on the bench and contemplate life, you'll be there for a while. I know, I hear that train go by every morning when I get up, and through the day from time to time. It's off in the distance moaning its presence as it rumbles past taking Oranges and Gravel north, and stopping traffic on the way. Count the cars, kids, it will be through soon enough!